“In many ways, fiscal year 1986 was one of Amtrak’s most successful years,” wrote then-Amtrak President W. Graham Claytor, Jr. in that year’s annual report. “Through it all Amtrak kept a keen eye on the bottom line and displayed an overriding concern for improving service, increasing revenues and controlling costs.” Setting a new revenue record was all the more rewarding since the annual federal investment in the company had been reduced 14 percent over the prior fiscal year. crews for services outside the Northeast Corridor. 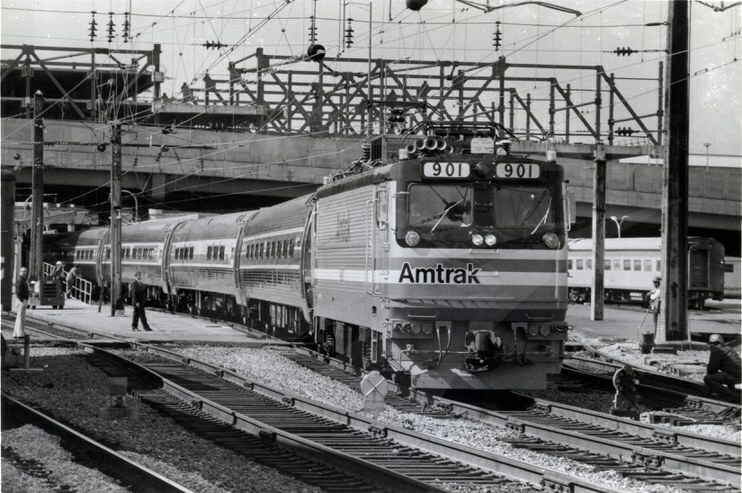 In FY 1986, Amtrak turned the page on a significant chapter in its 15-year existence by gaining the right to directly hire train and engine (T&E) crews for services off of the Northeast Corridor (NEC). 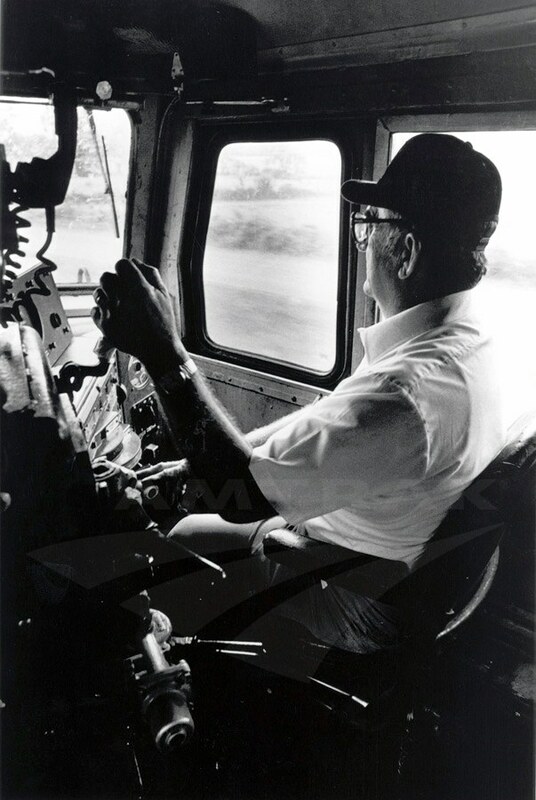 After reaching agreements with the Brotherhood of Locomotive Engineers and the United Transportation Union, the company began to directly employ engineers, conductors, assistant conductors and firemen who had previously provided passenger services under contracts with various freight railroads. Claytor called this effort “one of the most significant advances in Amtrak’s history, enabling the company to achieve its own ambitious productivity goals while improving the quality of rail passenger service we provide the traveling public.” The changeover occurred on groups of routes over the next year-and-a-half. To save resources, the Crescent and other national network trains reduced service over parts of their routes during the off-peak winter season. On a related note, Amtrak held its first assistant conductor training program in late summer 1986. A class of 23 men and women reviewed passenger relations, ticket and fare accounting, equipment and signal operations, and general rules and regulations dealing with train operations. All were assigned to the NEC upon graduation. As part of overall efforts to strengthen the workforce, managers also continued to undergo leadership training. The courses emphasized improvements to corporate culture, business ethics, communication and business practices. Amtrak also identified ways to more efficiently deploy its resources. 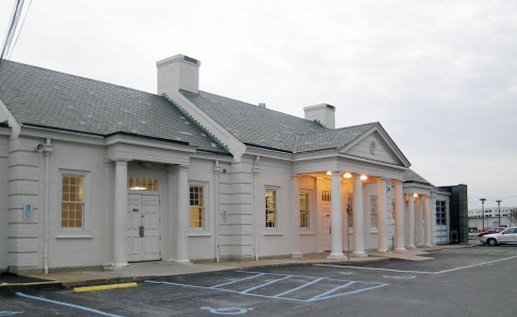 Two of five reservation sales offices – in Carle Place, N.Y., and Jacksonville – were consolidated into three remaining locations. At the same time, a new main frame computer at the Philadelphia Data Center enabled the company to meet increasing data processing needs. 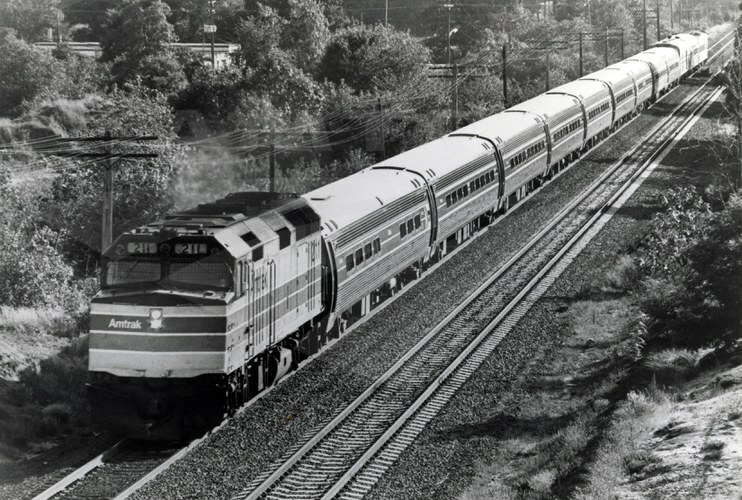 During the off-peak winter season, the Palmetto (New York-Savannah) was cut back to Washington, D.C., during the week, and the Pioneer (Chicago-Salt Lake City-Seattle) went to a tri-weekly schedule west of Salt Lake City, while the Crescent (New York-New Orleans) did the same south of Atlanta. North of Washington Union Station, Amtrak unveiled new locomotive and car maintenance buildings and a commissary at the Ivy City facility. Laid out to meet modern work flows and incorporate new technologies, the structures were funded under the Northeast Corridor Improvement Project. Amtrak also marked completion of upgrades to its Michigan Line between Porter, Ind., and Kalamazoo, Mich. A track and signal renewal program brought authorized train speeds up to 79 mph. As that project wrapped up, work began with New Jersey Transit on a three-year, $60 million upgrade of the line connecting Philadelphia and Atlantic City in anticipation of launching new Washington/New York/Philadelphia-Atlantic City services. Southern Railway depot in Raleigh. The national system map underwent visible changes in FY 1986 due in part to the actions of freight railroad partners over whose tracks Amtrak operated long-distance trains. When CSX abandoned track between Petersburg, Va., and Raleigh, N.C., Amtrak rerouted the Silver Star (New York-Miami) via Rocky Mount, N.C. Subsequently, Henderson, N.C., lost service, and Amtrak had to relocate its stop in Raleigh from the former Seaboard station to the old Southern Railway depot west of downtown. Indianapolis received added service when the Cardinal (New York-Cincinnati-Chicago) was rerouted through the city to serve Union Station, which had been renovated as a festival marketplace and hotel complex. Dwight, Ill., was added as a stop on the Loop (Chicago-Springfield) and State House (Chicago-St. Louis), while the Silver Meteor (New York-Miami) gained a stop in Okeechobee, Fla.
Due to increasing mail traffic, which meant longer train consists, Amtrak decided to operate the Capitol Limited (Washington-Pittsburgh-Chicago) and Broadway Limited (New York-Pittsburgh-Chicago) as fully separate trains. The two trains had previously been operated as one between Pittsburgh and Chicago. Under contract to the Commonwealth of Massachusetts, Amtrak operated a service between New York City and picturesque Cape Cod on summer weekends. between Washington and New York. In the Northeast, new weekday morning Metroliner Service frequencies were added between Washington and New York. As an enhancement for business travelers, Railfones were expanded to all New York-Washington Metroliner Service trains, where they netted a profit. Customers traveling in club service could take advantage of advance boarding at originating terminals, complimentary coffee and wine and larger menus. Work began on the restoration of Washington Union Station, while a new station opened in Providence, R.I., as part of a larger urban redevelopment project. These customer enhancements and quick Metroliner running times added up to success when in the first quarter of the year, “Amtrak became the leading carrier in the Washington-New York air-rail passenger market, surpassing Eastern Airlines.” Metroliner Service ridership rose 13.2 percent in FY 1986, and Amtrak captured 32 percent of the total Washington-New York air/rail market. 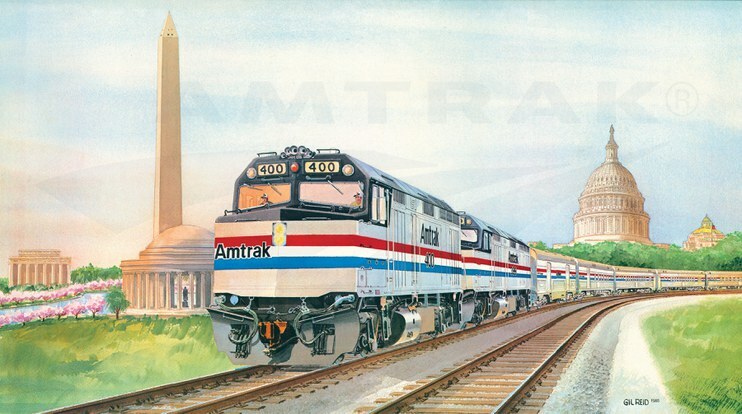 The Marketing and Operating departments worked hard to sell what Amtrak termed the “distinctiveness” of rail travel – aspects that set it apart from other travel choices. Regular passengers on the Montrealer (Washington-New York-Montreal) were delighted to see “Le Pub” return to the train after being discontinued in the mid-1970s. It featured a cocktail lounge with piano player that especially appealed to the apres-ski crowd. 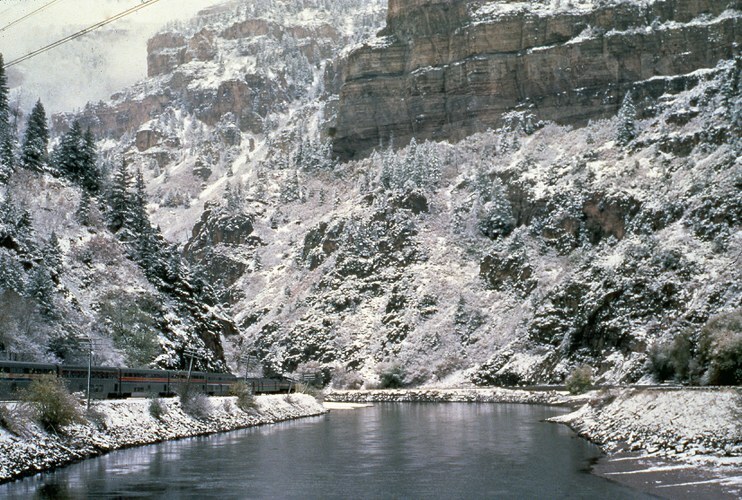 The Marketing department worked to sell the "distinctiveness" of rail travel, such as the views of Glenwood Canyon from the California Zephyr. Based on the success of the “Superliner Experience” on the Southwest Chief (Chicago-Albuquerque-Los Angeles) – which introduced route guides, movies and games in the Sightseer Lounge car, and specialty drinks and snacks at a “hospitality hour” – Amtrak expanded the program to the Empire Builder (Chicago-Seattle/Portland), California Zephyr (Chicago-Denver-San Francisco) and Coast Starlight (Los Angeles-Seattle). Customers transferring between trains in Chicago in fall 1986 may have caught a glimpse of filming for the Oscar-nominated gangster movie The Untouchables starring Kevin Costner, Robert DeNiro and Sean Connery. One of the film’s iconic scenes is a shoot-out on one of the grand staircases leading into the station’s Great Hall. 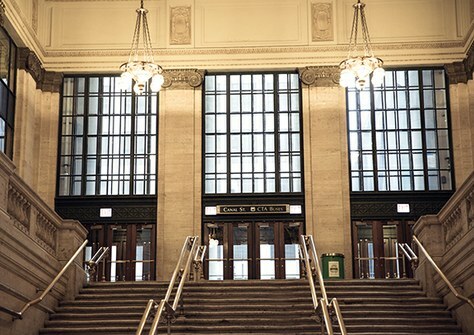 Young stars Kevin Bacon and Elizabeth McGovern also worked on scenes at Chicago Union Station for She’s Having a Baby. Booking a trip was made easier through the new “A-Plus” ticketing and reservation system. It established a permanent computerized record for a traveler to speed the ticketing process. “A-Plus” customers could also quickly book tickets that were held at will-call windows in Washington, Philadelphia and New York. Continuing a trend that had begun a few years earlier, Amtrak linked its reservation system, ARROW, with that of a third major airline – United Airlines’ Apollo services. Counting links to American Airlines’ SABRE Total Access system and Trans World Airlines’ PARS, more than 26,000 travel agencies now had access to ARROW. Amtrak also became the first non-airline member of the Airline Reporting Corporation, which made it easier for those travel agencies to process Amtrak ticket sales. “Prudence and productivity…must be our watchwords now and for the future,” Amtrak declared in its FY 1986 annual report. Many of the initiatives begun or advanced that year demonstrated the company’s commitment to meeting these objectives. National Railroad Passenger Corporation, Annual Report (Fiscal Year 1986).